Fenty Beauty Popped Out With a Pop-Up Shop! Surprise! Fenty Beauty is hosting a series of pop-up shops in New York City to promote the release of its Moroccan Spice palette. The Moroccan-themed event started Wednesday at New York City’s Pennsylvania Plaza. The event was outdoors and was decorated nicely with Moroccan decor—including a hookah lounge. Rihanna’s Fenty Beauty has been a huge success—though I’m convinced that even if the cosmetics were trash, her fans would continue to support. But happily, the brand has continually provided us with goodies that are black-girl friendly. You know, sometimes we hate how much we love Rihanna. Speaking to a few supporters at the pop-up, buyers said they had come out because they were either makeup enthusiasts or Rihanna enthusiasts. “I’m into makeup in general, but since it’s Rihanna, I decided to come out,” said shopper Victoria Uyo. Attendee Michelle Neal added that she’d hoped to see Rihanna at the event. “I dragged my friend out so we could get first grabs—and we hoped to see Rihanna, of course,” she said. 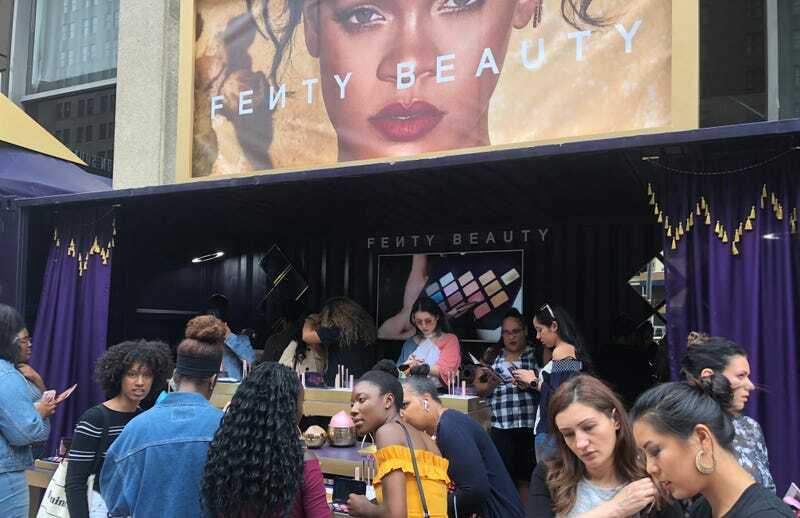 Though the star wasn’t at Wednesday’s event, all of Fenty’s new and old products were on site, along with makeup artists to help shade-match and apply the products to shoppers. Fenty’s newest products will officially launch July 6, but pop-up shoppers had early access to the Moroccan Spice palette, the darker sister to last year’s Galaxy palette. To assist with application, Rih also added in a Pro Filter Eye Primer and two eye shadow brushes: one for packing shadow on the lid and the other for blending out the crease. Flyliner, a long-wearing liquid eyeliner, was also released. It’s a staple product we haven’t seen from the brand yet, with a shade cleverly named Cuz I’m Black. The felt tip liner holds up to its name because it’s extremely black and stays on forever; I swatched it on my hand hours ago, and it won’t budge. If you ask me, the pop-up event was pretty cute. Hopefully, Rihanna will make it even cuter by popping up at one of them.